From September 1 – November 30, 2018, with the purchase of 200 Fujifilm LTO Ultrium 7 data tapes receive one free Surface Go (limit two Surface Go per end user)! 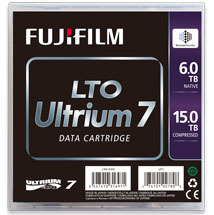 For aggregate purchase of 200 Fujifilm LTO Ultrium 7 data tapes during the period from September 1 - November 30, 2018, FUJIFILM Recording Media U.S.A., Inc. ("Fujifilm") will provide the end user purchaser with one free Surface Go (MSRP: U.S. $399 per Surface Go). Limit two Surface Go per end user purchaser, for a maximum two Surface Go (MSRP: U.S. $399 per Surface Go). Prior purchases, back-ordered product purchases, purchases made outside the continental U.S. or by Fujifilm resellers are not eligible for this promotion. May not be combined with other offers. To receive your free Surface Go, submit completed claim form located at www.tapepower.com/surfacego, together with copies of all applicable invoices, to Fujifilm program administrator by fax at (201) 313-5763 or email to: aleece.nolan@valueaddedfulfillment.com for receipt on or before December 31, 2018. Claims and purchase documentation are subject to verification and will be disqualified if proven invalid by program administrator. Claims received after December 31, 2018 will not qualify. Please allow 15 business days for promotion processing and receipt of Surface Go, which will be shipped by Fujifilm to the end user business address in the continental U.S. indicated on the claim form via standard ground shipping. Offer is void where prohibited. FUJIFILM and the Barium Ferrite logo are the registered trademarks of FUJIFILM Corporation. LTO and ULTRIUM are the registered trademarks of Hewlett Packard Corporation, IBM and Quantum Corporation. TTo claim your Surface Go please fill out the claim form and fax or email us a copy of your invoice to our program administrator at (fax) 201.313.5763 or (email) aleece.nolan@valueaddedfulfillment.com. Claims are subject to verification and will be disqualified if proven invalid by our program administrator. Call 800.488.3854 with any questions.